Prelude to Season XI: Giveaways! It’s been a while since the last giveaway, and Star Trek Online has stepped up it’s game for this years launch promotions for Season XI; A New Dawn. Beginning with a really nice giveaway yesterday in part to unofficially celebrate ‘Back to the Future Day’, a number of free ‘things’ are on the way for every player in the game. 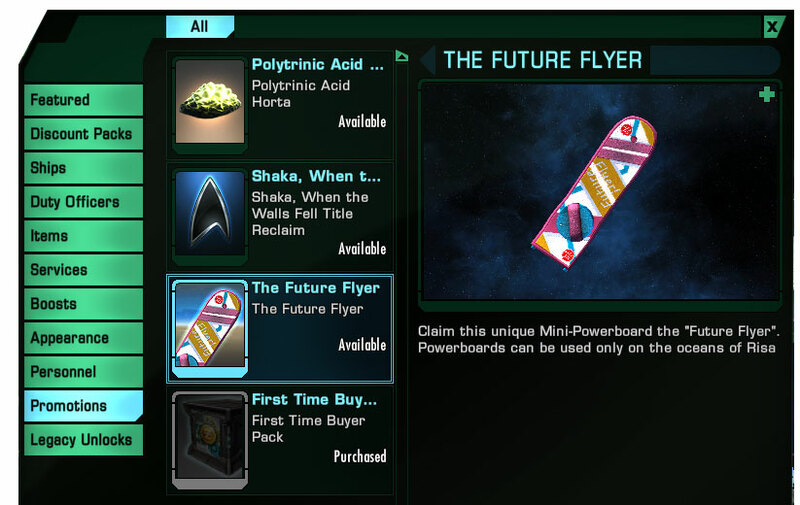 On Wednesday, the first freebie to drop is The Future Flyer, an Elite quality hoverboard that looks surprising familiar to a certain movie prop from Back to the Future II. Now unlike the movie version which would cease functioning when it leaves the ‘powered’ streets of 2015 – when it travels across water – this version has been modified by the ingenious techs of the Lobi Consortium. A quick comparison with the board’s evil twin from last-summer’s Risa events (an uncanny duplicate of Biff’s Hoverboard), and you’ll find it to be a really decent competitor on the race circuit next summer. Best of all it won’t cost 1000+ lohlunat favors to acquire. Yeah, yeah I wish it could be used on land – and – I wish it could be used on other maps. In any case this is a really nice and unexpected gift from the team at Star Trek Online. Some minor fallout from this situation has been detected. The perpetrators brought anomalous technology with them across multiple time streams, and the destruction of their time travel gear coincided with the destruction of the anomalous tech. The rapid decay of their flux capacitance technology, combined with the destruction of so many items with different quantum signatures, resulted in a phenomenon known as a ‘quantum snap’. When a significant number of objects from disparate timelines are destroyed simultaneously, the timeline quickly attempts to correct the phase displacement, often forcibly. This particular quantum snap resulted in a single ripple of information passing rapidly through time, and the subsequent temporal disruption it caused could be detected by anyone with the appropriate technology. This displaced information is mostly harmless historical data. However, some Ferengi working at the resort on Risa discovered plans for an item that is anomalous to our timeline, and have managed to reproduce it using current technology. Interestingly enough, they even managed to solve a design flaw that limited its use on water. The item is now freely available to utilize on Risa, despite some concerns from the TIB on the matter. We will, of course, remain vigilant for any future temporal infractions. The board is available for free from the Zen Store; look under the promotions tab. This promotion is available from October 21st to 26th ONLY. This first official give-away of the pre-season XI promotion is 1 free 12-slot Inventory upgrade per character. This extremely-time-limited bonus is only available between October 22nd at 9AM and October 23rd at 10AM PDT. If you haven’t already taken advantage of this, don’t wait and get it before time runs out. Surrounding the new Admiralty System has been concern that we won’t have room for new ships with each of our alts. Coming later in the season is a new ‘Drydock’ feature (more in my next post) that will allow us to store our ships indefinitely, freeing up slots for new ship without having to lose the ship permanently. While ‘Drydock’ remains an excellent Quality of Life improvement, one small drawback is that the ship in Drydock loses it’s gear storage capacity, returning it to your inventory. 12 additional slots is a nice gesture to help us out!